Geoffrey Huntington lives in a house by the sea not far from where the ghost of a pirate is said to eternally walk the cliffs in search of his lost gold. 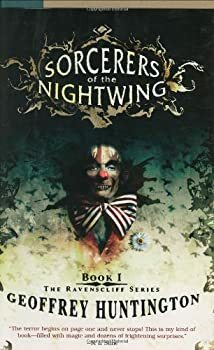 He is the author of Sorcerers of the Nightwing: Book I of the Ravenscliff Series, which introduced the world to the young sorcerer Devon March. Under another name, he is the author of several acclaimed works of fiction and nonfiction. Read excerpts of the Ravenscliff novels at the Ravenscliff website. Ravenscliff — (2002-2003) Ages 9-12. The third Ravenscliff novel will be called Blood Moon. Publisher: Every kid fears the monsters in the closet — but for Devon March, the monsters are all too real. Horrible things come slithering out across his floor, determined to drag him with them back down their Hellhole. But Devon is no ordinary young man. He can move objects with his mind, summon incredible strength, disappear at will — and that’s only what he has discovered he’s capable of so far. Yet his powers — and the demons in his closet — remain for him unexplained mysteries. At fourteen, Devon is sent to live at Ravenscliff, a dark seaside mansion, where he learns the first part of the secret of his powers: he is a sorcerer of the Order of the Nightwing, a three-thousand-year-old tradition of mysticism and magic that fascinates Devon with its fabled history. But Devon’s new family, the Muirs, forbids him from discovering any more about his heritage, inexplicably terrified of what that knowledge might bring. At Ravenscliff, Devon must contend not only with the demons but with a strange, precocious eight-year-old boy who may prove to be the link to the most fearful demon of all: the Madman, who wants to unleash the creatures of the Hellhole for his own malevolent gain. Ravenscliff is built over one of the largest Hellholes in the world, and the uninitiated Devon must fight off the demons with the help of his new friends from Misery Point High — including the dazzling Cecily Crandall, raised at Ravenscliff and the holder of a few secrets herself. After his father's death, fourteen year old Devon March is sent to his new home in New England — the huge and forbidding mansion Ravenscliff, that all the townspeople he meets on his way warn him against travelling to. But Devon is not as afraid of his future as others in his shoes would be: he knows he is gifted with a special power, a power that protected him from the very real demons and monsters that he had dwelling in his cupboard and under his bed as a child. Now, he seeks to find who he is, and why such things happen to him, for on his death bed, his father claimed he was not his biological father. Guided by the calm and powerful Voice in his head, that grants to him his own brand of magic, Devon is eager to begin his investigation.